Momma Melly: April Fools Trip! My best friend is amazing! She surprised me with a trip Vegas!! I thought we were going to Maine... But nope! Best April fools day joke, EVER! I have never been out of Canada, so this was an unreal experience. We even traveled over to Hollywood for the day, I still can barely believe it. I had a lovely vacation, but I was excited to come home to my fiance and son. 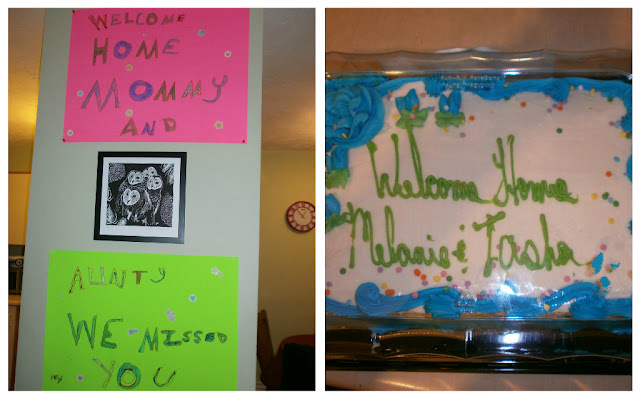 When I walked in the door they went out of their way to make welcome home signs. Also, they picked up a cake. It made me tear up, they are my world.